While perusing my social media accounts last night I came across a quirky, tongue-in-cheek, yet serious and somber musical tribute to Lonesome George (see the end of this post). For those who this name is not familiar to, Lonesome George was the last Pinta Island Galapagos tortoise (Chelonoidis abingdoni) to walk the face of the Earth. He is gone and so is his species. The vast majority of the time we have no idea when a species may go extinct. It is estimated that between 200 to 2000 species go extinct every year...many of these have never even been discovered. It is rare that we know the exact time that a species vanishes for eternity. Eight 'o'clock AM on June 24th in the year 2012 was the moment the Pinta Island Galapagos tortoise was added to the list of extinct animals. 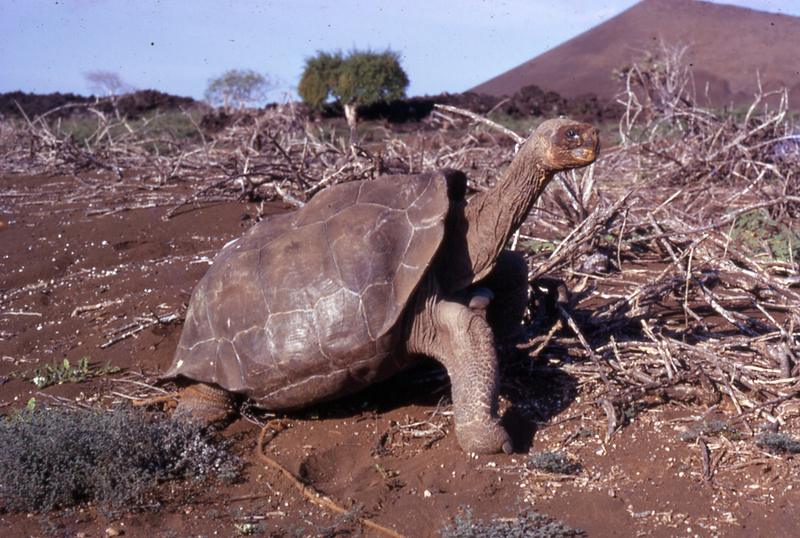 Lonesome George was a conservation icon and a symbol of hope for his species' recovery. That hope lasted for thirty-nine years...the length of time George was in captivity and every attempt was made to breed him with a similar species to retain his unique genes. The news of his demise traveled fast and hit hard. The night I found out, I wrote a blog post, not unlike this one. Being a turtle biologist and conservationist, his death hit me pretty hard as well. This is a group of animals that I have dedicated thirty-two years to learning about, providing captive husbandry for, researching, educating about, and being held completely in awe of, and George was "The" turtle. Lonesome George photographed on the morning of his removal from Pinta Island (1971). Photo by Peter C. H. Pritchard. After his death, Lonesome George was necropsied and it was determined that he died of apparent natural causes. He was neither young or old by turtle standards, being around 100 years of age. He was frozen and sent to the American Museum of Natural History for preservation. Master taxidermist, George Dante, and staff of the AMNH worked painstakingly for two years to bring George "back to life." George was on display at the AMNH, until recently, and will be sent back to Ecuador so he can continue to be a symbol; albeit of a different sort. Myself with Lonesome George at the American Museum of Natural History. Photo by Max Barresi. Unfortunately, too many of these wondrous creatures are facing the same fate. Take for example the Yangzee giant softshell turtle (Rafetus swinhoei) of southern China and Vietnam. Only four known specimens exist in the world, a pair in the Suzhou Zoo (China), one in Hoan Kiem Lake in central Hanoi, and one in Dong Mo Lake west of Hanoi. Heroic efforts are being made to try and breed the the Suzhou pair; but after six years the project has yet to be successful. The radiated tortoise (Astrochelys radiata) of Madagascar was perhaps the most abundant tortoise, with a population numbering around 12 million in 2005; it is now projected to become extinct in approximately 45 years. Yet another profound example is the ploughshare tortoise (Astrochelys yniphora), also from Madacasgar, whose population hovers around 600 animals in the wild, and at current rates of exploitation will become extinct in 10-15 years. Unfortunately, I could go on and on listing other species as today turtles are the most endangered vertebrate animal group with 51% of species being threatened with extinction. Many of my friends and colleagues work tirelessly to make sure no other species are lost forever. In fact, the Turtle Survival Alliance uses as their motto "zero turtle extinctions in the 21st century." Of course, the reset button for that had to be pushed after the passing of Lonesome George; but to be fair, his species was functionally extinct long before that. "Whatever happens to this single animal, let him always remind us that the fate of all living things on Earth is in human hands." - these words were inscribed on the information panel outside the enclosure of Lonesome George at the Charles Darwin Research Station, Galapagos, Ecuador.